of slowing the hair loss process... and keeping the hair you have! conscious about the wide gaps on my scalp." at the difference NuHair® did for me. Thank you!" needed it to work quickly! and friends as well. I've also noticed a lot less of it falling out." 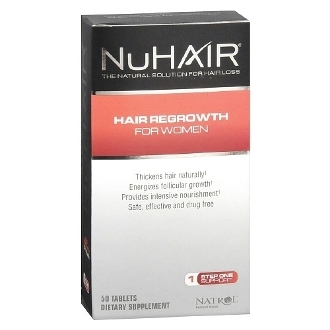 Results achieve using the complete NuHair® Hair Regrowth Support System. Hair Regrowth for Women, DHT Blocker and the Thinning Hair Serum.